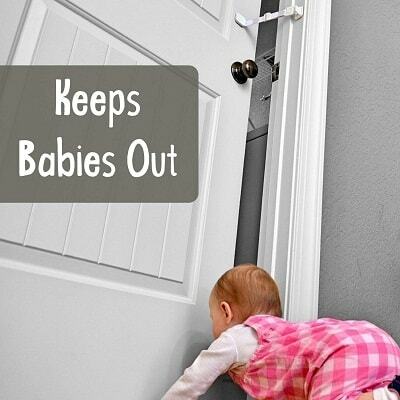 It is important to take precautions and utmost care to ensure that the child in the house is safe at all times. Keep doors, cabinets, and wardrobes locked or child-proof. There is no telling when your child can open the door and head out onto the streets or pull something off a cabinet and hurt themselves in any way. Which is why here are a few childproof door locks that you must have in your home. These products are some of the best available in the industry and available for you to easily buy on Amazon.com. These white doorknob covers come in a pack of 4, making it easier for you to child-proof as multiple rooms and doors in your house. They are quick and easy to install and come in a soothing white color that blends easily with your home decor. It has a minimalistic design and is compatible with most spherical door knobs. Compatible with most spherical door knobs. Easy to install – just click, and it’s ready to go. Openings on the sides for easy access for adults. A soothing white color that matches any decor. Completely safe for your child. It might be slightly big for small door knobs, making the cover hang and slightly difficult to use. A simple and hassle-free solution to child-proofing your home, you can clip these door knobs on to make your home safer for your child. These baby proof door knobs come in a pack of 4, allowing you to child-proof multiple doors in your home. If you have other door handles in your home, then this is the child-proofing system that you are looking for. The lever lock is an easy installation device that keeps the door handles in place and prevents your child from turning them when not needed. Turning of a lever is prevented by the handle, two buttons on the side can disable it. Once it is disabled, you can also see a yellow indicator on the lever that indicates anyone can open it. This childproof door handle lever comes with an adhesive back that can be easily installed on your doors. It also has a decoy button that can divert your child’s attention when trying to unlock the door. Has a decoy button that ensures your child doesn’t open any doors. Easy to install – comes with an adhesive back. A yellow indicator that shows when the system is disabled. Only suitable for handles and not knobs. Only one device per purchase. Protect your home with this door handle lever lock. It is easy to install and ensures that your child doesn’t try to open the door with a decoy button forcibly. It’s a child safety lock for doors. Along with doors, cabinets and wardrobes need to be child-proofed as well to avoid them from removing something and harming themselves. Which is why Jool Baby also brings to you cabinet locks that come in a handy U-shape. The lock can easily be slid onto the two cabinet handles and locked from the other side to prevent your child from opening them. Sturdy to ensure your child doesn’t open the door, no matter how mischievous and stubborn. Universal design suitable for wardrobe and cabinet handles of all sizes. Suitable only for double-door cabinets and wardrobes. The handles need to be close for effective child-proofing. 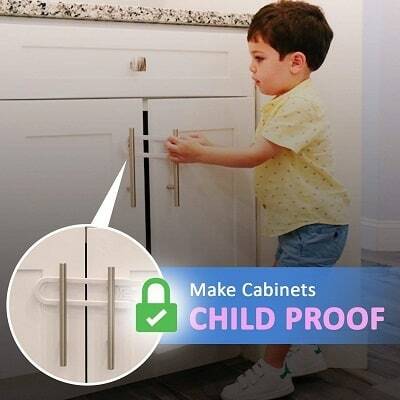 This child-proofing system is absolutely easy to install and doesn’t involve a lot of complex actions to remove when you need to open your cabinets. It has a sturdy design to ensure that your child doesn’t open the cabinets even with strong tugging. The Door Monkey is an absolutely easy device to install on your dors, whether a knob or a handle operate them. It comes with a clasp that is suitable for standard door sizes. It has a lever on one side that locks the door with the help of the door frame or the wall. To open, you simply need to pull the lever or press a button from the other side. The clasp comes with a rubber lining that ensures that it doesn’t affect the door finish and ensures that the device is installed properly. It can be installed higher on the door to ensure that your young children don’t enter the room. It can also keep pets away when your child is taking a nap. There is also a pinch guard that can be used by flipping the device and clipping it the other way around. This ensures that while the room is ventilated, the door doesn’t hurt anyone in case it closes suddenly. Can be installed on any height that’s preferable. Keeps the door slightly ajar to keep the room ventilated. Easy unlocking by just pulling a lever or pressing a button. The door is always slightly open. Not only does it work with any kind of doors and handles, but it is also absolutely easy to install. You can adjust the height according to your preferences, and it is easily openable from either side. 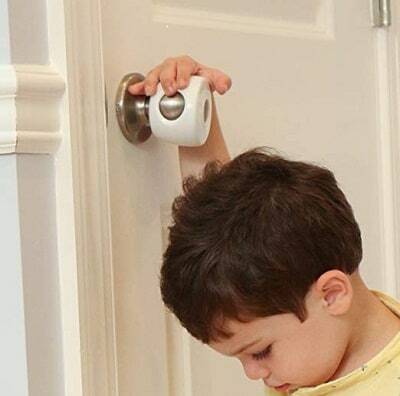 This is another doorknob cover that ensures that your child doesn’t open unwanted doors and remains safe. 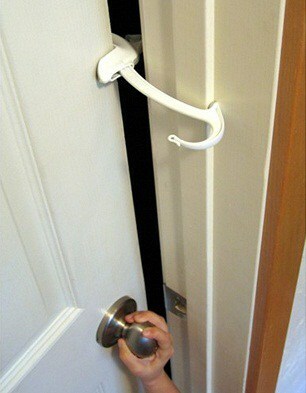 It comes with an easy to install design, and you can easily clip it onto your door knobs. Two grip areas allow you to open the door easily. It is also made from eco-friendly PP and TPR. The cover is slightly larger than the knob, ensuring that you are successfully baby proofing the door. Made from eco-friendly PP and TPR. Easy grip tabs for easy opening of doors. Suitable for most door knob sizes. It is best that you check the size of your doorknob when buying this as it is not suitable for large door knobs. Easy to install, it allows you to easily child-proof your home. It comes with grip tabs that allow you to easily open the door while keeping your child safe at all times. If you have a feline in the house along with a child, you need not to keep your grown pet in safe rooms along with your child at all times. This door lock comes with an adjustable strap that gives enough space for your pet felines to move around freely while keeping your child safe. It comes with an adhesive side which you can easily stick onto the door frame and an adjustable strap. It can easily adjust to the size of your feline. It also functions as a perfect child-proof device that ensures your child doesn’t enter rooms that aren’t entirely safe for them. It can be installed as high as you want away from the reach of your pets and children to ensure that they don’t meddle with the system. The door is left slightly ajar to promote ventilation. You can also easily undo it when you need to use the door. A perfect pick for homes with babies and felines. Allows the feline to move around while keeping the baby safe. Height is adjustable according to your needs. You can easily undo the lock when you want to use the door. Keeps the door slightly open to promote ventilation. It is a semi-permanent safety device – you can remove the adhesive back if you want to use it elsewhere. Functions only from one side. Having a home with a child and a feline can be slightly difficult. This device makes sure that you don’t use two separate devices to ensure that your feline is comfortable and your child is safe. It is important that your house remains a safe place for your child at all times. These simple devices are not only pocket-friendly but are easily installable and also makes sure that your child remains safe. Each of these devices is easily available on Amazon.com and come at reasonable prices. Some of these devices are also suitable for use for pets or to keep your pets away from your children when they are asleep. So go ahead and get these easy child proof door knob covers and locks for your home and prevent your child from entering areas that are not entirely safe for them. You can also use them to keep your children away from harmful chemicals and kitchen cutlery.